Thuillier Child Bebe, 16 1/2" tall, she is dressed in an original nurse uniform, Red Cross or possibly as a nun? The André Florent Thuillier doll company of Paris, France produced excellent quality antique child, bisque head bebes on a wood, composition or kid body, early dolls have a closed mouth, later dolls had either a closed or open mouth. 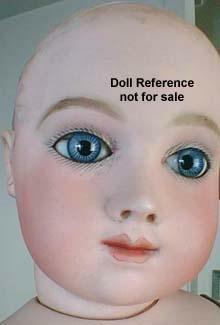 Some of their antique bisque doll heads were produced by the Francois Gaultier doll company. 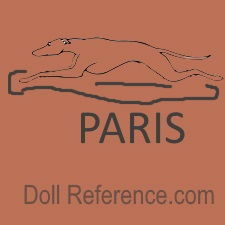 All known Thuillier dolls are identified by the doll mark AT with a size number of 1 to 15 between the initials that co-responds to an actual size of between 9 inches to 36 1/2" tall. Doll shoes by Thuillier may also be marked AT inside an oval. Thuillier dolls are extremely rare. 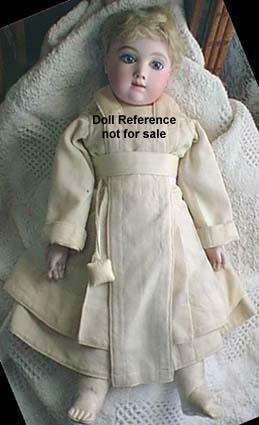 Thus, if you can't obtain an original antique Thuillier doll, reproduction dolls can often be found. Thuillier Child Doll, about 16 1/2" tall, marked on the back of her head, A 7 T, bisque swivel head on a shoulder plate, with pierced ears, blue paperweight eyes, blonde mohair wig, kid leather body with jointed knees and elbows and bisque lower arms and hands.